The House DC is one of our partners assisting us in changing communities. They service teenagers in after school activities keeping them off the streets and out of trouble. They are a faith based organization and have been in existence for 20 years. We held our second annual “Turkey Bowl” on November 16th. Our local officers participating this year could not have been more helpful. Not only did they serve the kids dinner but they also sang and did some pretty crazy dances. 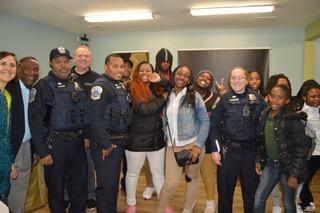 A good time was had by all and we strengthened the relationship between our next generation and our local cops!! I was honored to be named the “Volunteer of the Year” for the House DC as part of my work with their organization and Code 3.